taking off in full reheat for a max performance rotation and climb. 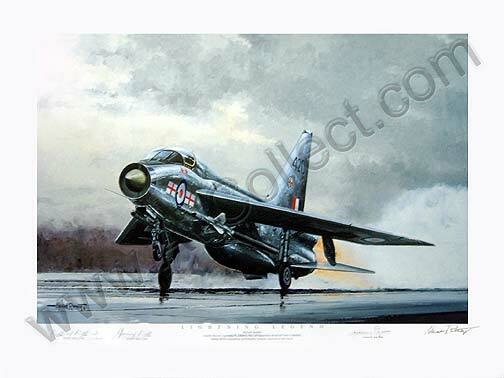 and the Counter Aviation Authority (CAA) set about keeping surviving examples grounded.However, not all fighters die, and some Lightning's did not fade away either. 'Bee' Beamont flew Hurricanes in the Battle of Britain and went on the command 609 Typhoon Sqn and the first Tempest wing, ending the war with 10 victories and accounting for 32 V-1 flying bombs. After the war he became one of the best-known British Test Pilots, first flying the Lighting, Canberra and TSR 2 and was Panavia Tornado Director of Flight Ops. and the first radar equipped F-86D with the USAF. at English Electric/BAC test flying Lightning, TSR 2 and Jaguar. (EE Chief Production Test Pilot). many aircraft types before joining English Electric as a Test Pilot. and became Lighting Chief Production Test Pilot. from XL628, the prototype T4, famously surviving 28 hours at sea. on those who flew it, were associated with or simply loved it. LIGHTNING LEGEND is a collector's gem to keep those memories alive. Collectair sealand individually signed by Michael Rondot. print to guarantee the total edition size and authenticity.